Join Elan Travel’s winter 7 night golf tournament Puerto Vallarta Jan. 27, 2017. 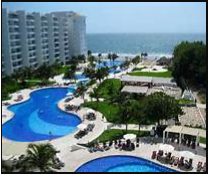 The five star Dreams Villamagna all-inclusive resort is located on Nuevo Vallarta beach. It has 6 restaurants, 5 bars, 3 pools, Jacuzzi, a spa, and privileges at two nearby golf courses. The rooms feature: A/C and ceiling fan, Wi-Fi, satellite TV, CD/DVD players, mini-bar. Unlimited local wine, spirits and beer, 24 hour room service, movies on the beach, fitness centre, tennis courts, unlimited golf, non-motorized water sports. WIN BACK THE COST OF THE TRIP! During your stay, Germain will be organizing a two day golf tournament, everyone will win a prize but the person with the lowest CALLOWAY score will receive the grand prize ….. A cheque refunding the cost of the trip!! Space is limited book early.